Hire axemen displays they are a great show for all the family, they show the traditional tree felling skills that are still used today in this technological age. ”Hire axemen displays”, they are great fun for all the guests to see. The team will perform demonstrations and races of log axing, cross cut sawing, and springboard chopping, where they are wedged halfway up a tree and cutting from a board. Hire axemen displays they bring all their own materials and are a great act. There is a great commentary throughout and all your guests will find these shows most informative. We hire axemen displays throughout the UK and they are some of the most popular arena shows we have. We offer a wide range of arena acts and can fill your whole schedule with an array of different animal acts, human acts and motorised acts – we will be able to offer something for all your guests. The axemen arena acts and axemen arena displays are great shows unlike any other. 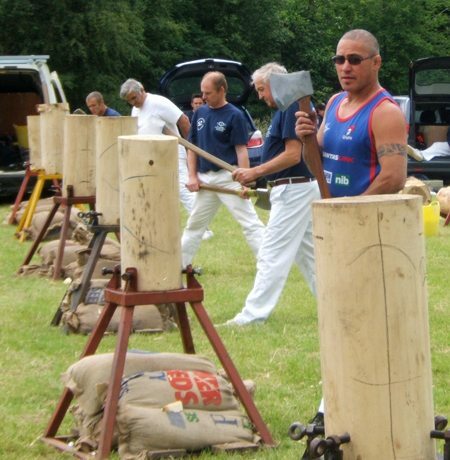 The axemen arena shows really get the audience involved and show a variety of the skills of the axemen. We hire axemen arena acts to a wide range of clients and they are always very popular. We hire axemen arena displays throughout the UK. We hire axemen arena shows as they are suitable for children and adults. The axemen shows are great and very educational. Hire axemen shows for a great arena act, when you hire arena acts you want something that will appeal to all audiences and this is the show. We hire arena displays to all the best County shows and find when you hire arena shows you get great arena attractions. Hire axemen displays, they are great as they are something not many guests will have seen before. The team are all professional lumberjacks and experts in their trade. We have a wide range of arena acts and all our clients who have hired the axemen displays have been impressed by their performances. We also have all the fairground rides and fun inflatables available so should be able to supply your whole event. We are a well-established entertainment agency, who have a wide experience in supplying acts and attractions. Call our experienced sales team for great ideas for your next event. Hire axemen displays as a great new attraction at events.